@peternlewis, this page conflicts with: Keyboard Maestro Variables (in the main Wiki segment). They need to be merged into one page ASAP to avoid conflicts and misinformation. If you’d like, I can do this. Just let me know which page should be the master. Please review this carefully, and fix as needed. Keyboard Maestro has four types of variables, distinguished based on their name. Password Variables — names start or end with “Password” or “PW”. 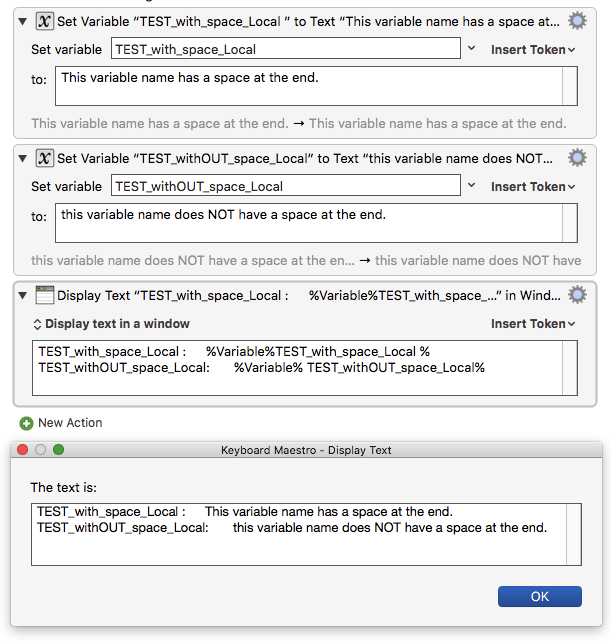 Local Variables — names start or end with “Local ” or “𝕃”. Instance Variables — names start or end with “Instance ” or “𝕀”. Variables — All other variables. I'm running Keyboard Maestro 8.0.1 (8.0.1) on macOS 10.11.6. Somethings wrong with the Preferences Window. I have merged the two into the manual. Variables can never have spaces at the start or end, and it shouldn’t matter if they do, so any exception to that is a bug. Looks good. Thanks for the quick response.